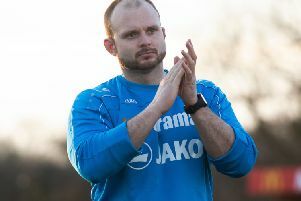 It is not often that a goalkeeper pops up with an equalising goal in stoppage time – let alone one from all of 70 yards out – but Tudors number one Jamie Butler says there was more than just pure luck involved in his dramatic late strike against Sutton United. Hemel were trailing 2-1 with just a few seconds left to play, when Butler launched the ball forward from inside his own half, deceiving Sutton keeper Ross Worner and flying into the top corner to rescue a point for his side. “I was thinking ‘if this one goes on target it is going to be difficult to deal with’ because I saw it for myself in the first half. I really had to keep my eye on any long shots. Butler is known in the division for his impressive distribution, and he says that he had fancied himself to find the net at some point during the season. “Today is my first official goal, but I had said to a couple of the boys at the start of the season that I fancied myself to score this year. I didn’t think it would be like this, I thought it would be a quick free-kick or something like that. Hemel showed great character to get something from the game, and Butler hailed the team spirit displayed by the Tudors even as the game looked to be slipping away from them. “It was a game of two halves – I thought in the first half they were on top because the wind and the overall conditions played a big part,” he said. “Going in at 1-0 down wasn’t the worst thing, but the conditions were a joke for their second goal. Someone’s tried to play a back-pass to me and it’s stopped 30 yards in front of me and then they’ve ended up scoring from it. Today is my first official goal, but I had said to a couple of the boys at the start of the season that I fancied myself to score this year. “But I think we’ve shown great character in the end – Deano (manager Dean Brennan) kept everyone going and we knew that there were goals in it for us.